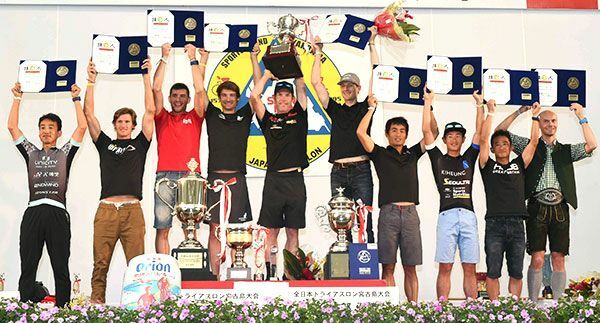 Miyakojima – The 33rd All Japan Triathlon Miyakojima (co-hosted by Miakojima City and Ryukyu Shimpo) held its award ceremony April 24 at the JTA Dome Miyakojima. The ceremony featured first time champion Cameron Brown (New Zealand) and women’s race champion Naomi Washizu (formerly Naomi Imaizu, Kanagawa), who won for the third time since 2008. The top ten finishers overall as well as the top three finishers from each age group in the men’s and women’s race were given awards. The winners met the applause and cheers of the other athletes with big smiles. At the celebration after the ceremony, athletes interacted with one another, vowing to see each other again at the next competition.